In some situations, an attorney must notify a client that they will no longer be represented, usually due to a breakdown in the attorney-client relationship. 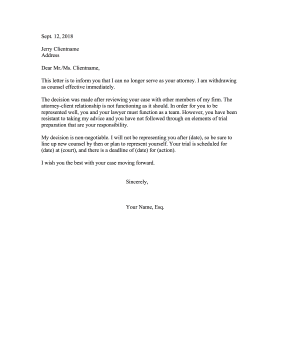 This letter formalizes the withdrawal and also relays pending court dates. This letter is to inform you that I can no longer serve as your attorney. I am withdrawing as counsel effective immediately. The decision was made after reviewing your case with other members of my firm. The attorney-client relationship is not functioning as it should. In order for you to be represented well, you and your lawyer must function as a team. However, you have been resistant to taking my advice and you have not followed through on elements of trial preparation that are your responsibility. My decision is non-negotiable. I will not be representing you after (date), so be sure to line up new counsel by then or plan to represent yourself. Your trial is scheduled for (date) at (court), and there is a deadline of (date) for (action). I wish you the best with your case moving forward.